MADISON, WIS. – In light of recent controversy surrounding Madison’s “drag scene,” a group of local queens aims to use their platform for the greater good. 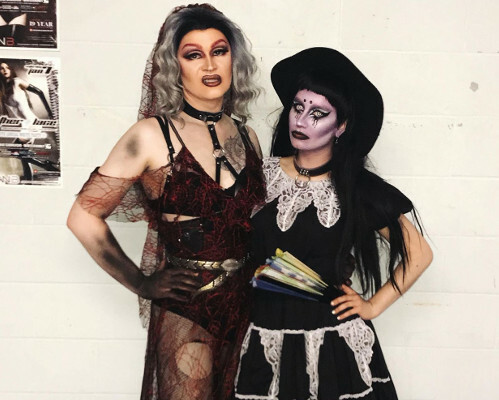 ‘Hysteria’ is a monthly drag show taking place at the new, dark, and quirky club, Crucible [3116 Commercial Ave. Madison, WI 53714]. Tips received from audience members are donated to a select community service group, business, or charity. Organizations are chosen based on their involvement with the LGBTQ+ community. “We want to give back to the organizations that fight for our rights and give us the freedom to do what we do,” says Gretta Grimm-Deville, the show’s founder and co-host. While the event is still new, Hysteria has already donated hundreds of dollars in tips to organizations such as Trans Law Help Wisconsin and Diverse & Resilient. The next installment of Hysteria is scheduled for February 7, 2019 at 9 p.m. The multimedia art showcase includes performances by Gretta and Garnett Grimm-Deville, Amethyst Von Trollenberg, Jasper Madison, and Lola Grim-Deville. The event is for ages 21 and up. There is a $5 cover charge at the door. More information can be found at hysteriashow.com or Hysteria’s Facebook and event page. Hysteria is a monthly drag show hosted by Gretta and Garnet Grimm-Deville. Each show aims to create an alternative space for queer people and performers that may not feel at home at traditional “gay clubs.” The drag styles presented at Hysteria are odd, spooky, conceptual, and above all else, a form of performance art. Hysteria events raise money for LGBTQ+ community service groups, businesses and charities.